. Why all the artwork in my workbook? 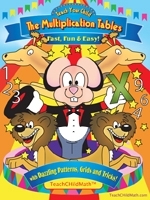 When I wrote my Teach Your Child the Multiplication Tables workbook, I wanted to create the excitement of a circus. I wanted each page to be as REAL as possible. I had my graphic artist, Rudy Rodriguez, create the cute circus animals and clowns. I thought it fitting that Rudy the Ringmaster be named for him. To make the times tables REAL, I used grids. Children can immediately see how the multiples increase from 1 x 1 to 10 x 10. This develops number sense. On a grid, they can see that 5 x 5 really equals 25 squares. Some children will quickly fill in the tables on the grid so I included circus figure watermarks for children to trace. I wanted to entertain children as they learned the times tables. Children who have an aptitude for math often have an aptitude for art. Because we were working so much with grids, I asked myself: Why not take the opportunity to teach basic drawing at the same time? We included eight pages of “copy the circus character on the grid”. I wanted a workbook that was also a fun activity workbook. I wanted a workbook that children couldn’t wait to work in. The first mom to receive a copy of my workbook took it with her on the family’s beach vacation. She told me her son promised to work on it 20 minutes a day. She knew she’d have to interrupt his afternoon each day. But to her surprise her son came out of his room after his nap with the workbook in hand. Rather than napping, he’d been filling it in. “I never had to ask him to do his math homework,” she said. “But to get him to nap, I did have to take the workbook away.” At that moment, I knew my book would be a success! Posted in Developing Number Sense., Math and Art | Comments Off on . Why all the artwork in my workbook? Yesterday, I tutored a 5th grade student in math. Julie is a smart girl but sometimes lacks confidence in her math skills. Her mother wanted her to work on ratios and percentages. I decided the math lesson would be more “real” if we worked with cents, dimes, nickels and quarters to learn percentages. After all, percent means per hundred. Our lowly penny is a cent, meaning one-hundredth. So it’s not hard to figure out that a penny/cent is 1% of a dollar. You need 100 of these to make a dollar. The math is written: 100 x .01 = $1. So one penny is 1/100 of a dollar. Divide 1 by 100 and you’ll get 1%. On the kitchen table, I scattered handfuls of pennies, nickels, dimes and quarters. After we figured out a penny was 1% of a dollar, we went on to quarters. Every child knows four quarters make a dollar. We represented a quarter as a fraction: ¼ and then divided 1 by 4 .and got .25 or 25%. Two quarters represented 2/4 or 1/2 or 50% of a dollar. Three quarters represented 3/4 or 75%. With each of these computations, Julie handled the money, sliding it in place for the various math problems. We then worked with dimes (its root word means ten) and nickels. Interesting we have one coin named after the metal it’s made of. As a child, I had difficulty understanding a nickel which is larger than a thin dime was worth one half of a dime! So working with coins, we figured out percentages. Then we turned to ratios. I’d scatter an assortment of coins on the tabletop. “How many of the 12 coins are quarters?” I’d ask. We’d write the ratio: 3/12 and figure out the percent. Then I had Julie scatter the coins herself and make up her own percentage problems. So when you have the opportunity, make math real by having real objects to illustrate the math lesson. Posted in Developing Number Sense. | Comments Off on Make Math Real! For those of you who haven’t seen this, check out this site. Apparently, one million dollars fits into a grocery bag. It is staggering to see what a trillion acutally looks like. The graphics are amazing, easy for a child to grasp. Posted in Developing Number Sense. | Comments Off on What does a trillion dollars look like? A standard egg carton or muffin tin. Dried beans, M&M’s or other small objects. Cut off 2 of the egg cups so that you now have 10. Now have your child divide these 24 beans into 4 cups. State the problem: “4 x 6 = 24.” Your child is not only learning about grouping but also the commutative property of multiplication, that is, 6 x 4 = 4 x 6. The order of the numbers does not change the result: 6 x 4 = 24 and 4 x 6 = 24. Addition is also commutative: 6 + 4 is the same as 4 + 6. The order does not matter: 6 + 4 = 10 and 4 + 6 = 10. Or 4 + 6 = 6 + 4. Now divide these 24 beans into 8 cups. Next divide into 3 cups. Again repeat the multiplication problem: 8 x 3 = 24 and 3 x 8 = 24. This fun activity is also teaching your child division as he/she is dividing 24 objects into 8 cups and so on. Your child will see that division is the inverse of multiplication: 24 divided by 8 = 3 and 3 x 8 = 24. Continue this multiplication activity by counting out 12 beans and dividing in 4 cups etc. It is probably best to do a few of these a day so the activity remains fun. Activities such as this develop your child’s number sense. Your kitchen is the heart of your home. It is also your “science lab” as this is where ingredients such as eggs, flour, sugar, baking powder and vanilla through the “magic of heat” become yummy cakes and cupcakes. Be sure to involve your children while baking. Not only are they learning about measuring but also combining ingredients in certain proportions. By asking your child to help double your recipe, you reinforce multiplication skills. Your child will see the value of multiplication in every day life. Learning to follow a recipe also teaches your child about fractions. More on this in another blog. You are currently browsing the archives for the Developing Number Sense. category.